How to Paint Unfinished Wood Furniture - w/ Video! Painting an unfinished wooden fixture is an easy way to add some flair to your storefront or office! 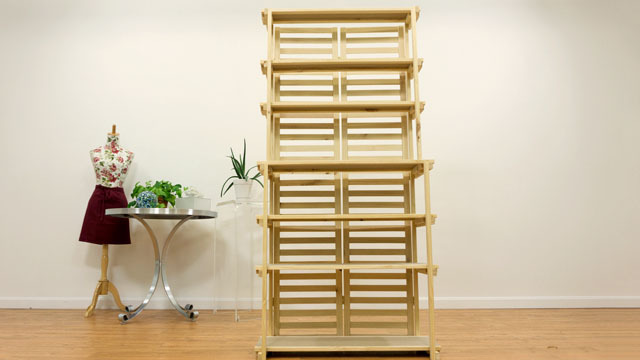 With just a few supplies and a little elbow grease, you can turn a traditional wood shelving unit into a totally custom and branded store display! Paint the rack in your brand’s color scheme or stencil on your custom logo - the sky’s the limit! We decided to help out our friends at the Bristol Animal Shelter by painting a wooden shelving unit in the brand's colors. To do the same for your business, just follow along with the steps below, or watch this video! Gather your supplies and great ready to paint! Start by prepping your work area. Lay out a drop cloth and remove any hardware, like knobs and pulls, from the piece you’re painting. Use 220 grit sandpaper to sand the entire fixture. This step is especially important for furniture with raw wood grain. When finished, wipe away any dust with a dry cloth. If using a power sander, wearing a mask is always a good idea. Now prime to seal the wood! We recommend an oil-based primer for fixtures that will see a lot of use, like store displays, as the oil-base acts as a stain blocker. Oil-based primers are also recommended for sealing raw wood. Give the primer at least 2 hours to dry completely. Whenever you're using an oil-based primer, it's best to be in a well ventilated area. After priming, sand the fixture again and wipe with a dry cloth. Using primer can raise the grain on unfinished wood, so it's especially important to sand between priming and painting. Now to the painting - 2 coats of the latex paint of your choosing! We recommend latex paint because it’s water-soluble, meaning it’s non-toxic and easy to clean. Use a roller on large surfaces and a brush on smaller ones, even grabbing a smaller sponge brush for the nooks and crannies where need be. Since we knew the rack was headed to an animal shelter after we were done, we decided to pump up the cuteness with some paw print stickers! We used two different sizes - one for the kitties and one for the doggies - and spread them out all over the racks and shelves! We also sanded off any dried paint drips, did some touch ups using a small sponge brush, and used paint thinner to clean up the rack's hinges (which we were unfortunately not able to remove prior to painting). Here we are with the finished product! And below that, the finished rack in it's forever home - the Bristol Animal Shelter! For more information about the shelter, or to see adoptable animals, like Redmond here, visit friendsofthebristolanimalshelter.org. We'd love to see how your DIY painting project turns out! Post photos to our Facebook page!